After work tonight, deuces and I decided to go surfing. I had heard there was phosphorescence, which is when there is a certain type of algae, that lights up when disturbed. It is very rare, and only happens every year or two. A few years ago, my wife and I had gone to see it in the evening, and watched the waves break with little bits of light, almost a sparkle. It has to be very dark to see it. Well, tonight it wasn’t as dark. In fact the only reason we could go night surfing is that the La Jolla Shores Hotel has bright lights, which light up the surf enough, that you can go surfing if it is not too big. The down side is that you can not see the wave until is it about 4 feet away. A few times tonight, we were talking and got slammed by a surprise random wave. We parked my truck, easy to get good parking since it was night!, and walked to the water. It was a lovely night, a little overcast, and fairly cold. With this years Boz wetsuits, (Go Harry!) we were toasty warm. I kid you not, these are THE BEST wetsuits in the world, and very affordable. This years suit, is this new super amazing Japanese fabric, which literally feels like you are wearing pajamas, and lets in almost no water. I can duck dive, and it feels like a dry suit. Well Deuces and I were in up to about our stomachs, and I hear her scream, I look down and scream myself! What I see is that as our legs are moving through the water, it looks like someone has a blue flashlight, and is shining all around them under water. Fricking blew my mind. We start splashing, and laughing, and gushing surprise. She jumps on her board and starts paddling. Every arm stroke made a splash of this dramatic blue color. 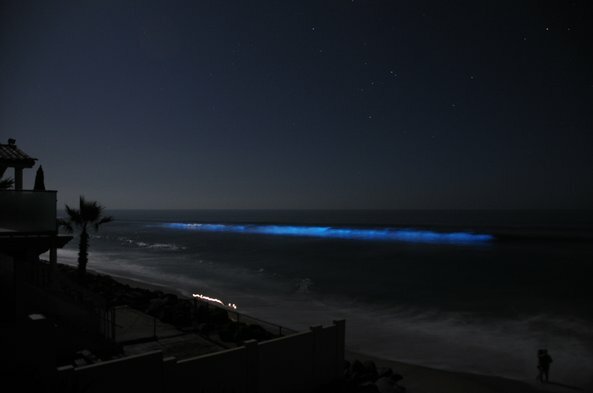 I have a picture on this blog, that was taken by Ana Phelps on a different night, which actually shows the color when a wave broke. This is not a touched up photo, this is the actual color and brightness. It was just mind blowing. The trail behind Deuces that she left as she paddled, was a dance of blue light. I spread my fingers and drug them through the water, and behind each finger was a train of blue light, as if I was finger painting with light. It was so extreme that I commented that no one was going to believe us, and that if you saw the same thing in a movie, you would think it was bad special effects since it was so extreme. In all the decades I have gone in the ocean I have never seen anything like it. It was one of the most lovely things I have ever seen in nature in my entire life. Just breathtaking, and I am sure a once in a lifetime opportunity.